Warm water linked to the blob appears to have knocked back Gulf of Alaska cod. Fishing fleets, many based in Washington, are bracing for cuts. Gulf of Alaska cod populations appear to have nose-dived, a collapse fishery scientists believe is linked to warm water temperatures known as “the blob” that peaked in 2015. 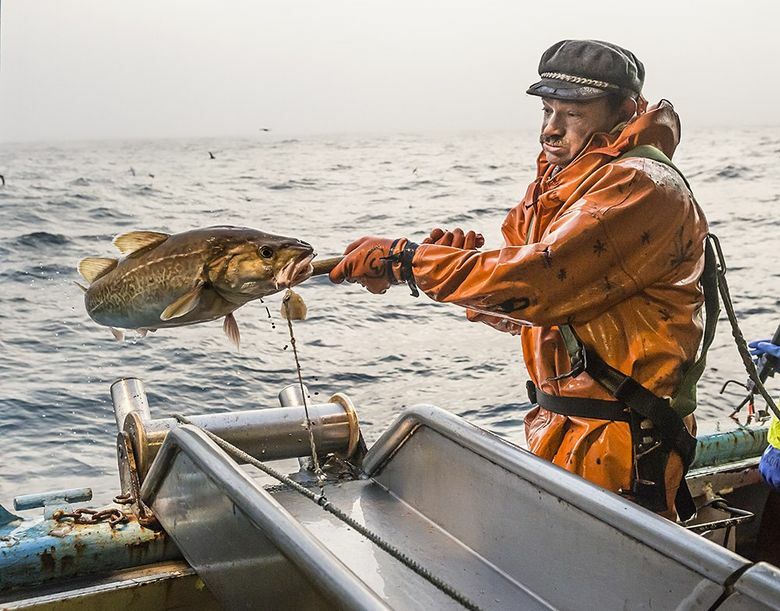 The decline is expected to substantially reduce the Gulf cod harvests that in recent years have been worth — before processing — more than $50 million to Northwest and Alaska fishermen who catch them with nets, pot traps and baited hooks set along the sea bottom. The blob also could foreshadow the effects of climate change on the marine ecosystem off Alaska’s coast, where chilly waters rich with food sustain North America’s richest fisheries. Federal fisheries biologist Steve Barbeaux says that the warm water, which has spread to depths of more than 1,000 feet, hit the cod like a kind of double-whammy. Higher temperatures sped up the rate at which young cod burned calories while reducing the food available for the cod to consume. “They get weak and die or get eaten by something else,” said Barbeaux, who in October presented preliminary survey findings to scientists and industry officials at an Anchorage meeting of the North Pacific Fishery Management Council. The 2017 trawl net survey found the lowest numbers of cod on record, more than 70 percent lower than the survey found two years earlier. Barbeaux said the cod decline likely resulted from the blob, a huge influx of warm Pacific Ocean water that stretched — during its 2015 peak — from the Gulf of Alaska to California’s offshore waters. Biologists tracked increases in bird die-offs, whale strandings and other events such as toxic algae blooms. Even today, its effects appear to linger, such as in the dismal survey results for salmon this past summer off Oregon and Washington. Scientists don’t ascribe the blob specifically to climate change. Gulf of Alaska temperatures — influenced by atmospheric conditions such as wind strengths — have always fluctuated over time. But researchers have never before tracked such an extreme heat wave that spread across such distances and penetrated to such depths. And the blob, though now easing, is likely a preview of ocean temperatures expected later in the century as climate change intensifies. Climate scientists note that ocean temperatures are on the rise as the water absorbs most of the heat trapped by greenhouse gases in the atmosphere. Another major concern has been the effects of ocean acidification, as the water absorbs carbon dioxide from fossil-fuel emissions. In Alaska, that is expected to create problems for crab. The blob began to take hold in 2014, and within a year had raised temperatures as much as 7 degrees Fahrenheit in some surface waters of the Gulf of Alaska. In deeper waters, where cod feed, the temperature rose by more than 1 degree Fahrenheit. The surface temperatures recorded during the blob’s peak could be close to the average at century’s end, according to a report on climate change released last week by the U.S. Global Change Research Program. Thus, future blobs could push temperatures much higher than the most recent event. For NOAA Fisheries scientists such as the Seattle-based Barbeaux, the blob’s dramatic effects have become an important part off their research of a changing ocean that absorbs most of the heat from the buildup of greenhouse gases in the atmosphere. Under the Trump administration, NOAA Fisheries scientists have been able to openly post about climate change on agency webpages even as the topic has been purged from many Environmental Protection Agency and Interior Department online sites. Scientists are trying to unravel what happened to the Gulf of Alaska’s Pacific cod, which yields thick fillets that are a staple of fish and chips. They can live as long as 14 years, reaching weights of up to 12 pounds. They are found both in the Gulf of Alaska, and in even larger concentrations farther west, in the Bering Sea. Since cod are coldblooded, their metabolism ramps up and they need to eat more as ocean temperatures climb. Barbeaux calculates that by 2015, as the blob reached a peak intensity, the cod would have had to consume an additional 6 to 12 percent more food to maintain normal growth. As the water warmed, the appetites of other coldblooded creatures also increased. Meanwhile, evidence indicates that the higher temperatures reduced the amount of high-quality, high-fat zooplankton many species feed upon, according to Stephani Zador, a Seattle-based federal fisheries scientist. The warm water affected the Bering Sea and the Gulf of Alaska. 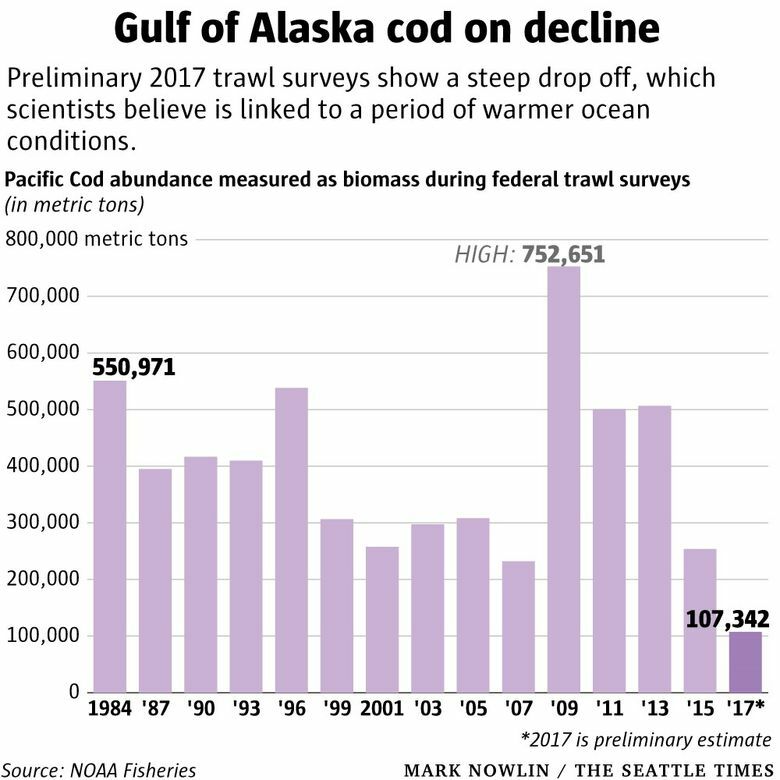 But the Bering Sea — unlike the Gulf — has a different ocean ecosystem influenced by the ice pack, and cod stocks there had a smaller decline, according to an initial analysis of a 2017 trawl survey. In the Gulf of Alaska, a lot of the cod hatched in 2012 appeared to survive their first year of life. So they looked like a good base for building future harvests. But by 2017, those fish were largely gone for the surveys, which also found scant evidence of fish born in subsequent years. Some fishermen this year also have had a hard time finding Gulf cod. Their total central Gulf of Alaska cod catch — with only two months of fishing left — lags far below the allowable harvest levels. Many of the cod that have come on board trawlers are long skinny fish that look to have had a hard time finding enough to eat, according to Brent Paine, executive director off United Catcher Boats, an organization of trawl boats that catch Gulf of Alaska cod. Barbeaux’s presentation in Anchorage was an early heads-up that the cod population appeared to have plummeted in the Gulf. In the weeks ahead, scientists will pore over the survey and other information to come up with a recommended harvest level for the North Pacific Fishery Management Council, which will decide on 2018 harvest levels for the Bering Sea and Gulf. Fishermen are bracing for cuts, with the only question being how big. The fishermen among the hardest-hit by cutbacks work in a largely Puget Sound-based fleet of more than 30 freezer longliners dependent on cod for most of their catch. If the harvest declines, some boats may end up tied to the dock. That fleet processes and freezes the catch on board, adding to the catch value that in 2016 totaled some $200 million from Gulf of Alaska and Bering Sea harvests. Some questions remain about the surveys. Perhaps some cod moved outside the areas that were included in the survey. But a spokesman for the freezer longliners says that overall, he trusts the scientists, whose research has helped keep Alaska fisheries sustainable. “What will really define the impacts is whether this is a long-term trend, or do the cod bounce back,” said Chad See, executive director of the Seattle-based Freezer Longline Coalition.